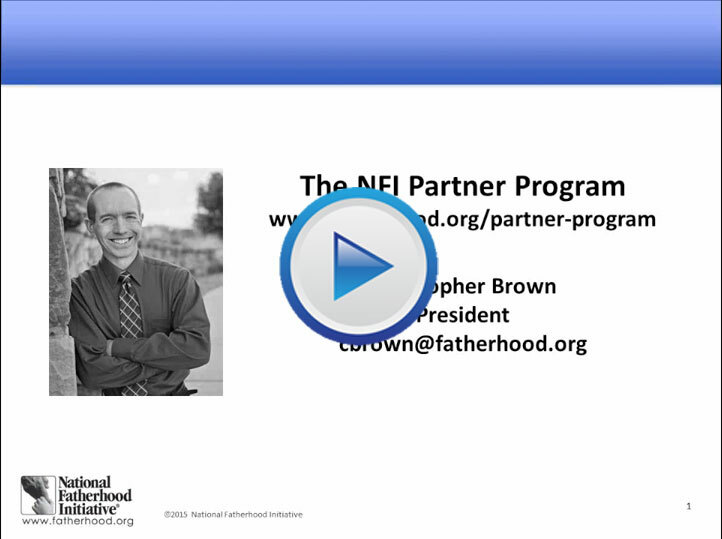 National Fatherhood Initiative's NEW Partner Program helps organizations, programs, and initiatives maximize effectiveness by building a stronger community presence, effectively training and equipping staff, securing funding and proving return on investment. Read the FAQs here. PARTNERSHIP APPLICATIONS DUE AUGUST 4, 2015, AT 5PM EST. We Recognize that Doing Fatherhood Work can be Hard. feel like an uphill battle. The Benefits of our Partner Program Help you Address These Challenges. initiatives, organizations and programs will launch and sustain successful fatherhood efforts. Leverage NFI’s recognized and respected brand and participate in NFI’s national partnerships with consumer brand and entertainment media companies. Connect with a diverse set of initiatives and organizations/programs across the country for peer-to-peer learning and best practices. Incorporate NFI's proprietary Father-Readiness Training Kit™. Get trained on how to address the most common pain points in effectively serving fathers. Raise funds from businesses and individuals in your community via NFI's national point-of-sale partnership. Learn how to create a diverse funding stream by effectively raising funds from individuals and private sources. Premier Partners can raise funds through a revenue share on the sale of NFI products. Benefit from NFI's national partnership which employs a proprietary analysis of outcomes to generate an impact report on up to 5 outcomes. Share the impact report with funders, staff, and other stakeholders.